According to weirdal.com, there will be a brief interview on CNN around 5:15 P.M. Pacific Time on Friday May 16. The show CNN runs at that time is called "Live from the Headlines." Yes and I think the topic they will be talking about is Al's upcoming song "Couch Potato" they will talk how Eminem denied his permission on making a music video and about giving his permisison or something like that. By looking at the date on CNN it looks like they interviewed Al on May 9, 2003 which was a Friday. Just click http://search.cnn.com/cnn/search?source ... l+yankovic and take a look at the date to the right it shows 05.09.03 and click on the link to read what it shows. Um, ETB, Dave said the show is called "Live from the Headlines". This leads me to believe that this will be a live interview. We will see on the 16th. This interview will be on CNN in the Eastern time zone, right? That would be 8:15 pm my time. Hopefully, I can get access to a tv around this place that gets CNN! Hehe. My D&D people are going to love me for probably not going this Friday or next Friday. I must record the CNN thing this Friday! Next Friday is the Bermuda chat. The CNN website article is almost an exact copy of someother press release which has been out for some time now. When RWS came out it was a live interview. 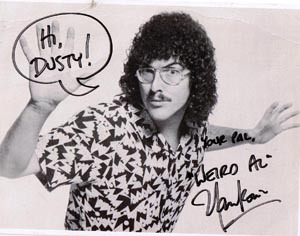 Thanks, Dustin, for supporting my theory about that upcoming interview! I think I have that '99 CNN interview on my computer. Unfortunately the tail end is cut off! Grrrr! Only 3 days! Woo! I have the Yoda and Pentiums sound checks on one of my live mix tapes. It's so cool. Excellent! That CNN interview is cool, too. Al is wearing the infamous black shirt he wore on the RWS insert. *Same shirt as on the TWS tee*. Yeah. I also have his performance of IAATP on CNN. Coolness! Thanks, marcusb! I'm sure that link will make lots of people happy!